The webinar on the Swedish healthcare market is part of Norcare’s series of webinars, workshops and events. 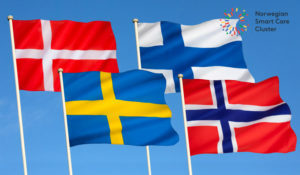 NorCare is a Nordic cooperation between Denmark, Norway, Sweden and Finland, focusing on implementation of Welfare Technology in the Nordic countries. • Join this webinar via your computer, smartphone or tablet. • Use headset and cable for internet for best quality if possible. • You do not need a webcam. • When you have asked to join the webinar you will receive a link via email. • Enter the webinar by clicking the link appx. 10 minutes before start. • Check the image and sound; and introduce yourself. • When the Webinar is over, you will have the opportunity to view it on demand on Business Region Göteborg’s homepage and from Norwegian Smart Care Cluster website, where it will be uploaded for 14 days.